One of our resident bands, #Hashtag perform “This Land Is Your Land” on 26 February 2019. The Santino Quintet at our special showcase on 18 December 2018 playing “You Can Never Tell”. Plenty of dancing going on! We occasionally visit The White Star, Liverpool for the Wednesday noon sing-around organised by the Button Street Badger Band. 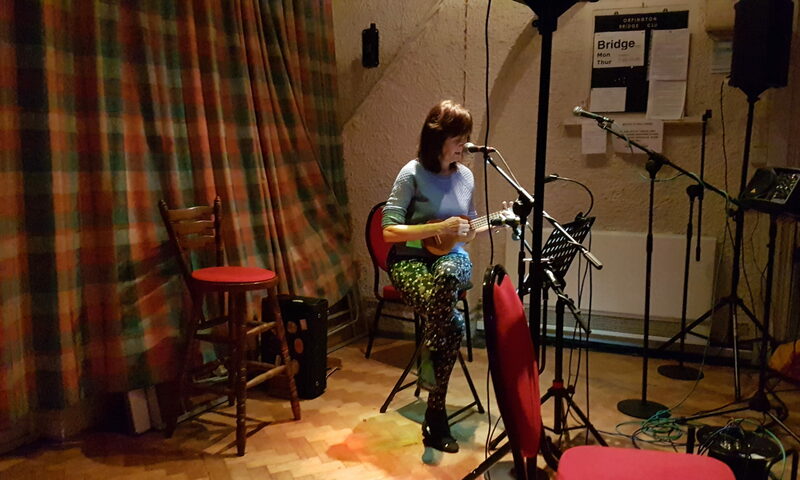 Here they perform Drowsy Maggie on 18 April 2018 with Jenny “Wren” Barnett on the Bodhran. And from the same session the BSBB with their end of session Mason’s Apron – so good it would be rude not include it! Tricity Vogue at our December 2017 Showcase – watch the audience collapse as Frank and Ivan get the word sheets mixed up! John Edwards and Jenny Barnett perform Dark Hollow at the Button Street Badger Band session at the White Star, Liverpool on 8 November 2017. Andy Roth plays Rosetta on 10 January 2017, a rare song as he normally just plays instrumentals! Sunrise are always welcome performers at OF&B but a house move has put them an hour away from us. Here we go back to 2016 for their rendition of “Islands In The Sun”. In July 2015, Tony “Golden Tonsils” Field gave us this splendid rendition of Dan Fogelberg’s “John Sutter’s Mill. Dave Harper (on harmonica) joins Hughie Jones, Mick Groves, the Willows Folk Club (Arundel) host Chris Davis back in November 2014 for the “Leaving of Liverpool”.